Video contains explicit language, but you already knew that. The East Village was a very different and much more dangerous place in 1978. But it was still a shock to everyone on the Downtown scene when Johnny Blitz, the Dead Boys’ drummer, was stabbed in a fight on Second Avenue. Street violence isn’t quite what it was in those days, but one thing hasn’t changed: the problem of musicians and medical insurance, or the lack thereof. 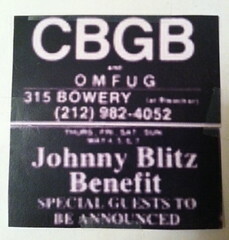 To help meet Blitz’s mounting medical bills, the CBGB community rallied with a four-day event, the Blitz Benefit (please, don’t call it “Punk Woodstock”). With a t-shirt created by the Ramones’ design guru, Arturo Vega, and more than 30 bands performing, it was a heartfelt outpouring of help and money for one of our own.